Internal bleeding should be taken seriously, and not just because it could indicate signs of severe trauma. This form of hemorrhage, which occurs in blood vessels far away from the skin (e.g., between internal organs) can deprive tissues affected of nutrients and oxygen, thus, increasing the risk of adverse events such as ischemia or necrosis. In some cases, uncontrolled or undetected internal bleeding could also be fatal. Internal bleeding is treated through the use of natural substances (or their derivatives) that may also be produced by the human body. However, it could be improved by speeding up the process of clotting, also known as coagulation, and by targeting the actual site of internal bleeding. A team of researchers claim to address these needs in their new paper, recently published in Scientific Reports. The novel intervention is believed to incorporate the magnetic properties of custom-made iron nanoparticles. The team helped deliver a dose of pro-clotting molecules to an experimental analog of an internal hemorrhage. The scientists involved in this study argued that this kind of work could increase the efficacy and efficiency with which internal bleeding is stopped. This could also help bring down the mortality rates associated with such events. The researchers, working at ITMO University and the Regional Cardiovascular Centre in St. Petersburg, developed the nanotechnology using materials that have been used as medical-grade treatments in humans, in the past. The materials were a type of iron oxide (magnetized Fe3O4, which the researchers termed 'Ferria') combined with the enzyme, thrombin. This treatment was also packaged in a hydrosol-gel for delivery into the body. The Ferria compound could also be magnetized for controlled delivery to the desired location once in the body. The team, therefore, reasoned, the complete treatment could target sites of internal bleeding through the migration of the iron particles to a blood vessel breach, and the promotion of clotting with the exogenous thrombin. 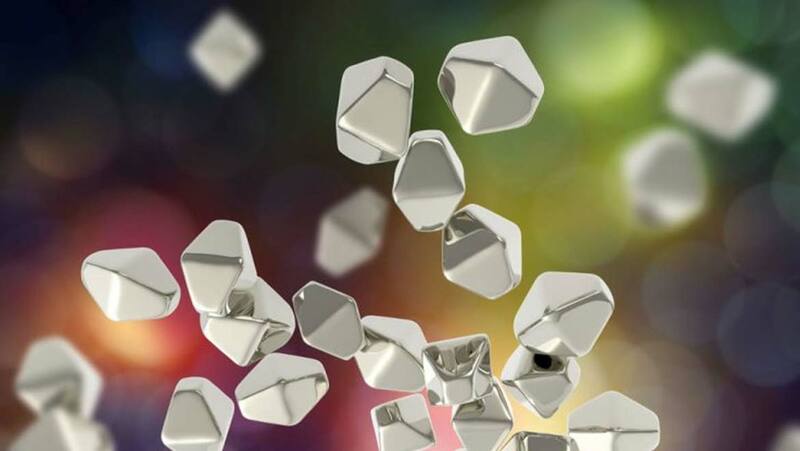 The team, led by Vladimir Vinogradov of ITMO University, chose the iron compound, also known as magnetite, as it has been used in the magnetism-guided treatment of anemia, and is as a contrast agent in magnetic resonance imaging. Magnetite is also being incorporated into novel interventions that are also currently under evaluation for their potential in wound-healing. In this case, however, it was combined with hydrosol gel with the intention of delivering supplementary thrombin to a broken blood vessel. In addition, magnetite is being incorporated into novel interventions that are currently under evaluation for their potential in wound-healing. In this study, however, it was combined with hydrosol gel with the intention of delivering supplementary thrombin to a broken blood vessel. Thrombin is an enzyme that can kickstart the complicated biochemical process involved in blood clotting. The biomolecule can do this by activating a range of proteins known as clotting factors (e.g., factor XI). Alternatively, thrombin can take a 'shortcut' to the end-stages of clotting by converting protein fibrinogen into the active molecule, fibrin. In this study, the enzyme was combined with magnetite and hydrosol gel at a proportion of 10%. This combination was then dried out and 'sifted' for particle sizes of 200 nanometers or less (so it is safe for injection). Previous studies have shown that ferria can be significantly cytotoxic under certain conditions, such as in combination with some other polymer types. The administration of the iron compound has resulted in the death of as much as 45% of all cells in a given sample. But the exposure of cultured cells, of the HELF and HeLa lines, to doses of the thrombin/ferria gel (at concentrations of up to 200 μg/ml) resulted in cell-death rates of 19.2% and 12.4%, respectively, after 72 hours. Therefore, the researchers concluded that the resultant gel was safe and tolerable for administration. The researchers also tested the clot forming capabilities of the gel by measuring its optical density after incubation at 37⁰C. They found that this property was not superior to that associated with a comparable dose of pure thrombin. However, the addition of fibrinogen at concentrations of 2.8 and 3.9mg/ml resulted in an increased ability of the gel to induce clotting, until it was similar to that of the control thrombin. Fibrinogen would also abundantly available in a hypothetical living patient. Therefore, the researchers reported that their gel would effectively promote clotting in an experimental blood vessel. It should be noted that the team did not test their proposed intervention on a living system. Instead, they used an artificial model of a blood vessel. This apparatus resembled a simplified dialysis machine, which served a long plastic tube full of circulating liquid. This liquid was a substitute for human blood, complete with the appropriate concentrations of fibrinogen. 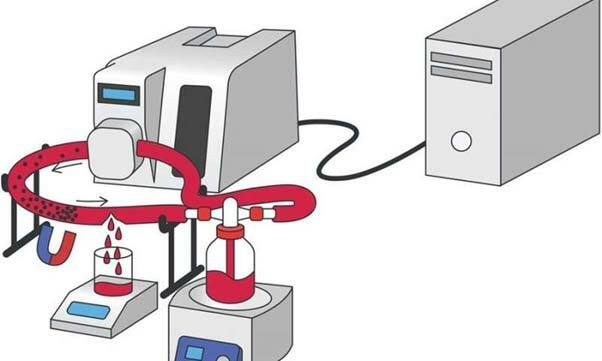 The researchers tested the duration and volume of a 'bleed' from this synthetic vessel with and without the introduction of the ferria/thrombin gel. The researchers added 1ml of a colloidal suspension of ferria/thrombin gel, directed to a puncture in the tube, using a magnetic implement. The group claimed that the treatment reduced the latency of hemostasis (or the stabilization of the blood supply through clotting), which was achieved by a factor of up to 3.3 compared to a control treatment. The control treatment also resulted in a fluid loss of up to 15.5 times that of the ferria/thrombin gel treatment. In addition, scanning electron microscopy (SEM) imaging of the tubing showed that the magnetite had formed a solid seal around the puncture site. Internal bleeding is a potentially severe medical issue that can result in death for some patients. However, this situation can be avoided by timely, effective treatment. A team of researchers from St. Petersburg have proposed a novel intervention, based on magnetism-powered targeting, as the next generation of treatment for internal bleeding. However, the innovation, which also delivers thrombin to the site of hemorrhage, depends on fibrinogen for its efficacy, as reported. Also, this procedure has not yet been tested in humans. It may be some time before we find out if this interesting response to the problems posed by internal bleeding is safe and acceptable for use in human patients. Shabanova EM, Drozdov AS, Fakhardo AF, Dudanov IP, Kovalchuk MS, Vinogradov VV. [email protected] nanoparticles for use as a hemostatic agent in internal bleeding. Scientific Reports. 2018;8(1):233. Drozdov AS, Volodina KV, Vinogradov VV, Vinogradov VV. Biocomposites for wound-healing based on sol-gel magnetite. RSC Advances. 2015;5(101):82992-7. Lundblad RL, Bradshaw RA, Gabriel D, Ortel TL, Lawson J, Mann KG. A review of the therapeutic uses of thrombin. Thrombosis and haemostasis. 2004;91(5):851-60.